نوری, علیرضا, مقدس نژاد, فریدون, خدایی, علی. (1398). بررسی عوامل تاثیر گذار و ارائه مدل مقاومت بیرون کشش ژئوکامپوزیت بین دو لایه آسفالتی. فصلنامه علمی - پژوهشی مهندسی حمل و نقل, 10(3), 425-445. علیرضا نوری; فریدون مقدس نژاد; علی خدایی. "بررسی عوامل تاثیر گذار و ارائه مدل مقاومت بیرون کشش ژئوکامپوزیت بین دو لایه آسفالتی". فصلنامه علمی - پژوهشی مهندسی حمل و نقل, 10, 3, 1398, 425-445. نوری, علیرضا, مقدس نژاد, فریدون, خدایی, علی. (1398). 'بررسی عوامل تاثیر گذار و ارائه مدل مقاومت بیرون کشش ژئوکامپوزیت بین دو لایه آسفالتی', فصلنامه علمی - پژوهشی مهندسی حمل و نقل, 10(3), pp. 425-445. نوری, علیرضا, مقدس نژاد, فریدون, خدایی, علی. بررسی عوامل تاثیر گذار و ارائه مدل مقاومت بیرون کشش ژئوکامپوزیت بین دو لایه آسفالتی. فصلنامه علمی - پژوهشی مهندسی حمل و نقل, 1398; 10(3): 425-445. یکی از راههای تعمیر روسازیهای ترک خورده به کارگیری روکش بر روی این گونه روسازیها می باشد که در این صورت روکش فوقانی مستعد بروز ترکها به شکل روسازی پیشین است. یکی از مهمترین روشهای پیشگیری از ترک خوردگی فوق که به ترک خوردگی انعکاسی موسوم است به کارگیری ژئوسنتتیک‌هاست. میزان گیرداری ژئوسنتتیک‌ها در بین لایه‌های آسفالتی در شرایطی که ژئوسنتتیک از عملکرد مسلح نمودن (Reinforcement) استفاده می‌نماید، اهمیت قابل توجهی دارد. همچنین میزان گیرداری ژئوسنتتیک می‌تواند میزان مقاومت برشی بین لایه‌های آسفالتی را تحت تاثیر خود قرار دهد و نهایتاً منجر به خرابیهایی گردد. به منظور شناخت میزان گیرداری ژئوسنتتیک‌ها در خاک آزمایش pull out یا بیرون کشش ژئوسنتتیک آزمایش مرسومی قلمداد می‌شود. با این وجود از این آزمایش در شناخت میزان گیرداری ژئوسنتتیک در بین لایه‌های آسفالتی استفاده چندانی نشده است. 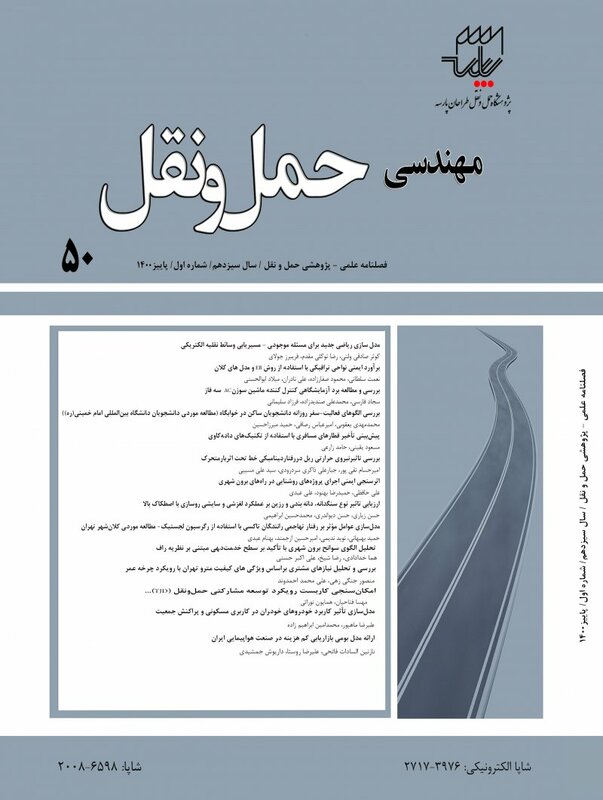 در این تحقیق دستگاه آزمایش بیرون کشش (Pull out) زئوسنتتیک که در دانشگاه صنعتی امیرکبیر توسعه داده شده است، به منظور ارزیابی میزان گیرداری ژئوکامپوزیت با اندازه شبکه های متفاوت در آسفالت به کار برده شد و تاثیر سه پارامتر موثر بر مقاومت بیرون کشش بر اساس طراحی آزمایش فول فاکتوریل بررسی و مقایسه گردید. نتایج بیانگر آن است که که مهمترین پارامتر موثر بر گیرداری ژئوکامپوزیت دما می باشد که به میزان دو برابر بیش از مقدار تک کت در میزان مقاومت یبرون کشش ژئوکامپوزیت موثر بوده است. همچنین سایز شبکه ژئوکامپوزیت اثر چندانی در مقاومت تحت بارگذاری یکنواخت از خود نشان نداده است. علاوه بر این با تحلیل تداخل‌های پارامترها مشخص شد که بیشترین تداخل میان پارامترها مربوط به تداخل میان دما و میزان تک کت به کار رفته بین دو لایه است. نهایتاً بر اساس محاسبات انجام گرفته مدلی رگرسیونی و ساده بر اساس پارامترهای موثر توسعه داده شد. Bae, A., Mohammad, L., Elseifi, M, Button, J. and Patel, N. (2010) "Effects of temperature on interface shear strength of emulsified tack coats and its relationship to rheological properties", Journal of the Transportation Research Board, No. 2180. pp. 21-26. -Baek, J. (2010) "Modeling reflective cracking development in hot mix asphalt overlays and quantification of control techniques", Urbana, Illinois: University of Illinois at Urbana-Champaign. pp. 12-22. -Bonin, G. C., Cantisani, G. and Loprencipe, G. (2007) "Dynamic effects in concrete airport pavement joints", Industria Italiana del Cemento Vol. 09, pp. 590-607. -Bozkurt, D. and Buttlar, W. G. (2002) "Three-dimensional finite element modeling to evaluate benefits of interlayer stress absorbing composite for reflective crack", FAA Airport Technology Transfer Conference, U.S. Department of Transportation, Federal Aviation Administration,Washington, DC , pp. 54-72. -Brown, S. F., Thom, N. H. and Sanders, P. J. (2001) "A study of grid reinforced asphalt to combat reflection cracking", Journal of the Association of Paving Technologists. Vol .70, pp. 543-571. -Canestrari, F. G. (2006)" Interlayer shear effect of geosynthetic reinforcements", Quebec: Proceedings of the 10th International Conference on Asphalt Pavements.pp. 34-44. -Coo, M. (2015) "Effect of sand, fly ash, and coarse aggregate gradation on preplaced". Construction and Building Materials ,Vol. 93, pp. 812–821. - Ezzein, Fawzy M. and Bathurst, Richard (2014) "A new approach to evaluate soil-geosynthetic interaction using a novel pullout test apparatus and transparent granular soil", Geotextiles and Geomembranes, Vol. 42, No. 3, pp. 246-255 . -Fallah, S. and Khodaii, A. (2015) "Reinforcing overlay to reduce reflection cracking ,an experimental investigation", Geotextiles and Geomembranes,Vol 43, pp. 216-227 (DOI:10.1016/j.geotexmem.2015.03.002). -Gupta, J. G. (2012) "Analytical model for design of geosynthetic reinforced pavements based on pullout tests", Second Pan American Geosynthetics Conference and Exhibition. Lima, Perú: GeoAmericas. -Khweir, K. F. (2003) "Influence of layer bonding on the prediction of pavement life", Proceedings of the Institute of Civil Engineers. -Ling, H. L. (2001) "Performance of geosynthetic-reinforced asphalt pavements", Journal of Geotechnical and Geoenvironmental Engineering, Vol. 127 , pp.177-184). -Lopes M. J. L. M. (1999) "Soil-geosynthetic interaction - influence of soil particle size and geosynthetic structure", Geosynthetics International, Vol. 6, pp. 327–342. -Moghadas Nejadad, F. N. (2014) "Effect of using geosynthetics on reflective crack prevention", International Journal of Pavement Engineering, Vol. 16, No. 6, pp. 1-11. -Penman, J., Hook, K. D. and Al-Qadi, I. (2008) "The use of geogrids to retard reflective cracking on airport runways, taxiways and aprons", Pavement Cracking, Taylor and Francis Group, London, ISBN 978-0-415-47575-4, Vol. 1 ,pp.713-720 . -Raab, C. (2004) "Interlayer shear performance :Experience with different pavement structures", Dübendorf, Switzerland: 3rd Eurasphalt and Eurobitume Congress Vienna. -Tashman L., Nam, K. and Papagiannakis , T. (2006) "Evaluation of the influence of tack coat construction factors on the bond strength between pavement layers", Washington Center for Asphalt Technology, Report# WCAT 06-002. -Villani, M. M. (2010) "Numerical modeling of the mechanical response of recycled materials in embankments", London: Taylor and Francis Group, Numerical Methods in Geotechnical Engineering , pp. 569-574. -Wang, Y. Q., Afsar, A. and Sung, J. (2009) "Optimization of brazing conditions for OFHC Cu and ASTM A501 low carbon steel by Taguchi method"., International Journal of Precision Engineering and Manufacturing, Vol. 10, No. 3, pp. 97-104, (DOI 10.1007/s12541-009-0053-9). -Zornberg, J. F. (2012) "Geosynthetic-reinforced unbound base courses:quantification of the reinforcement benefits", Austin, TX 78763-5080: Texas Department of Transportation.